David Burton is an American writer living in sunny Southern California. He traveled by motorcycle through Mexico, US, Canada and Alaska. From motorcycles he turned to the ocean, building and sailing his own boats to Mexico, Tahiti, Hawaii, and through the Panama Canal to Florida. He spent a lot of time reading while on the water, so he decided to write books he would have wanted to read at sea. Having swallowed the anchor he now mops floors and collects trash for money, writes for a living, and has become a (temporarily?) unrequited sailor. Welcome to my website. (A work in progress – when I’m not working on a new book or story, which is most of the time) No fancy graphics or photos here, yet. Just information about where you can find all my books and stories, Thrillers (supernatural and otherwise) and mysteries. Plus links to were they are available and first pages to read. Click the cover images on the right to go to the individual pages. Please post reviews of my books. Reviews help readers find good books. Thanks for your support! OR, you can sign up here. Fear Killer, a psychological suspense cautionary tale is now available in digital editions – mobi, epub and PDF. Click on the cover —–> for an excerpt, and where you can buy a copy. A paperback edition is now available, awaiting a new cover. Death is a silent companion on this quest for freedom and revenge. It’s there at every turn guiding Beth to vengeance for the injustice that no one has ever righted. Now, out on the sea where she is most at home with her friend and mentor Silas, Beth will follow death’s lead until she claims her due. Working on a rewrite of my psychological suspense novel, Fear Killer. Always looking for Beta Readers. Should be ready by Feb 1. Let me know if you’re interested. Next up, a follow up novella (a 1920s heist story featuring the 367 year old vamp, Simone Gireaux) to my novella Broken Bones which is directly related to my latest novel, Blood on the Bayou. Blood on the Bayou is the third in my Blood Justice series of contemporary urban fantasy thrillers. It is available in e-book and print editions. Or go here to read a short description and an excerpt. Ancient Mariners – a slightly paranormal, coming-of-age novel, is now available in print and e-book editions exclusively from Amazon. Buy from Amazon, or Kindle Unlimited subscribers can read for free. Click Here for more information and an excerpt. Ancient Mariners is a dark coming-of-age novel for adults and mature young adults. Beth, 14, and her crewmate, Silas, 45, have lost their families to violence. They sail the S Pacific, seeking solace for their grief. But Death has a task for them. When Beth’s best friend joins her in Australia, followed by her abusive father, Beth and Silas discover where Death’s journey is leading them. Broken Bones: A love and Revenge Story – a novella related to the forthcoming (November 1) novel Blood on the Bayou. It tells the story of the 240 year old vampire Simone Gireaux and the mortal Fin (from Blood on the Bayou) when they first met in New Orleans in the 1920s. E-book and Print editions are now available to buy from Amazon. Click Here for more information and an excerpt. Blood on the Bayou – the third in my Blood Justice series of contemporary urban fantasy thrillers will be published on November 1, 2017. Go here to pre-order a print copy. Or go here to read a short description and an excerpt. Broken Bones: A love and Revenge Story – a novella related to Blood on the Bayou – tells the story of Simone Gireaux and Fin(from Blood on the Bayou)when they first met in New Orleans in the 1920s. E-book edition is now available from Amazon. A print edition should be available within two weeks. Broken Bones is also part of the thrilling historical An Accidental Vampire series featuring the vampire Simone Gireaux. Ancient Mariners – a revised edition of a dark, slightly paranormal, coming-of-age, YA/NA (adults, too) novel. E-book is available now from Amazon. Print edition should be available within two weeks. The third book ( Blood on the Bayou) in my Blood Justice series has been accepted by the publisher. Now the editing begins! I’m writing a novella related to Blood on the Bayou – tentative title – Broken Bones: a Love story. I’m working on making them compatible. In the background is a revising of Fear Killer, a psychological suspense novel, and Ancient Mariners, a mature YA coming-of-age novel. Unfortunately, even further in the background, is expanding the novella Sneaker, into a full length novel. Sneaker is an offshoot of Soul Retrievers. An Accidental Vampire – Has a new cover to go with New Blood and Young Blood. An e-book mystery – Programed for Murder is now perma-free and ready to download on Smashwords and Amazon. The sequel to Programed for Murder – Programed for Love is available for download on Amazon and Smashwords. Mapping the Glades – New and available for download from Amazon and Smashwords. Soon available in print with a new cover. Passion Street – A hard-boiled mystery is available for download from Amazon and Smashwords. Soul Retrievers, a supernatural adventure, is now available for purchase in e-book and paperback editions. 7/10/2015 See links below. Soul Retrievers – To Hell and Back – Right now only available through Amazon. Lots of new vampire stuff – past, present and future. Past – A revised and expanded edition of the short story New Blood is now available. A new short, but enthusiastic, review of New Blood is there, too. 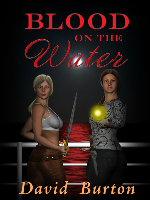 Present – Blood on the Water ( the sequel to Blood Justice) is now available. A new sci-fi, vampire mystery novella, Down Home, is now available. A new mystery novel, Passion Street is now available as an e-book on Amazon and Smashwords. And (excited drumroll) the paperback edition is now available! My occasional What If? blog is Here. Haven’t posted for quite a while but I’m hoping to get back to it soon. Soon, I hope to have pages for all my books and stories and be able to update what I’m up to and any news. I also have feature length movie scripts available. The titles will be listed soon. Contact me at dcburtonjr@gmail.com for more information.